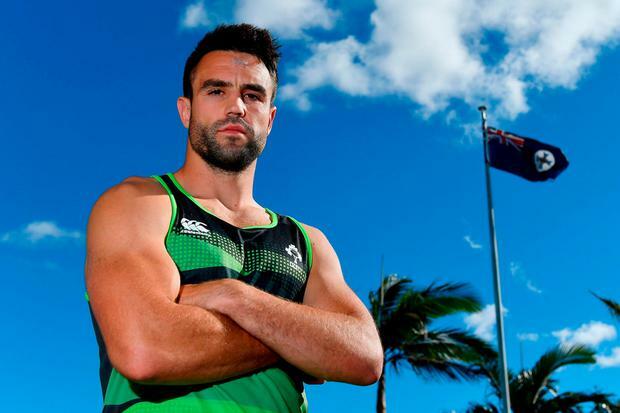 There is still unfinished business to conclude in green this season, but Conor Murray cannot help but get excited about Munster's prospects for next year after their capture of his international team-mate Joey Carbery. The 22-year-old is getting plenty of stick for his big decision to swap Leinster for their big rivals next season, with his Ireland squad-mates nick-naming him 'ROG'. Of course, Carbery is joining four other Irish-qualified out-halves on Munster's books and Murray is too experienced to risk upsetting a potential partner by ushering the new man straight into the No 10 shirt. Yet, having trained and played alongside the talented youngster for Ireland, he is confident that he will be a success at Thomond Park. "Yeah, definitely, there's a bit of slagging at the moment, calling him ROG!" he revealed with a smile. "It's great, it makes sense for Joey especially. He's looking to get more game-time, he's going to have to come down to Munster and compete for a place because there are lads who are hungry to have the No 10 jersey too because you've quite a few No 10s there now. "Joey will boost our squad massively, he's a class player. He's 22, he's learnt so much and has a lot of experience. "You can even see what he's learnt off Johnny, he steps in when Johnny steps out for reps and he's well able to take hold of the team and control what's going on. "It's very exciting. Game-time is when your partnership starts to grow properly but hanging around with him and getting to know him over the last few years has been brilliant and that'll definitely help when he comes down to Munster and start to build something there. "He's a top-quality player and it's really exciting for Munster and Ireland." 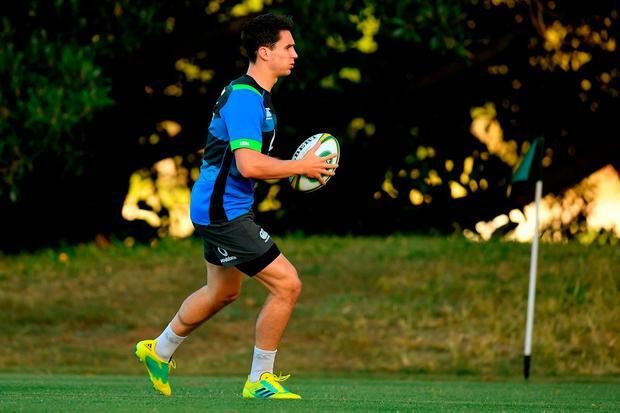 Carbery is far from the first player to swap blue for red and Murray is confident that the likes of Andrew Conway and Felix Jones will help him settle at his new home. "Absolutely, yeah, he can see that it's been done before," he said. "There's an opportunity there for him to go well, with Munster we've been doing really well and we're getting there. "This is just going to add another element to us. I'm sure the lads will tell him how to settle into Limerick life." Despite losing both their semi-finals in disappointing fashion, Murray is convinced that the province are on the right track. "It's been a great season obviously with Munster if disappointing towards the end of it," he said. "The Racing game definitely hurt me more than the Leinster semi-final, because against Racing we didn't play and gave them a lead and blew it a little bit. "You don't do that in semi-finals and then the Leinster one, pretty much after the game it's a tough thing to take but I was realistic about it. "Leinster are the best team at the moment, they are. "They deserve the success they've had this year; being a Munster man that can be tough but you've mates on that team too and you see them doing well, it is what it is. "That day against Leinster, we played well. We played one of our best games of the year and Leinster made a few changes, but we just came up short. "It's easier to take a defeat like that when you play well and they just played better, whereas the Racing game we just kind of gave them a lead, didn't play well and played catch-up. "You don't want to do that, you want to give yourself the best chance. "I think we're realistic, we're getting there with Munster definitely. "It is frustrating at times, but at least we fired a shot in that semi-final. We threw a few punches and we just came up short. "They were very, very good on the day too. "Nothing in it, but that just makes it easier to accept down the line when you reflect." While Munster came up short this season, Murray's international season has delivered in spades and he and his team-mates arrive in Australia unbeaten in a year, ranked second in the world and Grand Slam winners. That brings with it expectation, but Ireland are refusing to accept the favourites' tag against a team they haven't beaten here since 1979. "I wouldn't see it like that," he said of being favourites..
"We're coming to Australia in their backyard. They're a very tough side to play against, they beat New Zealand the last time they were in Suncorp so we're under no illusions. "Maybe our reputation to the wider rugby community is better than what it has been with the Grand Slam but I think as players, our group has a lot of experience, there's a few young guys who have tasted success quite early in their career, which is great for everyone and I think we're realistic in terms of what's needed to perform and what's needed to beat a top, top team in their own backyard. "So I think we're really realistic about that favourite tag. I don't know what's the chat out there, I genuinely don't hear that. "It's just an exciting challenge because we've done so well in the Six Nations and we want to continue that. We just want to keep on building and this is the next challenge for us." The experienced scrum-half is expecting a fast and furious first Test in Suncorp Stadium on Saturday. "Just from my experience playing against Australia, it's always really demanding on your lungs," Murray said. "They like to play with an awful lot of width, the game can break up at times and it's often played at quite a quick pace. It's going to be a massive challenge and this group wants it. I know this group wants to test themselves against the best and again, I'll keep saying it, it's a really exciting thing that we're facing into." Despite his healthy respect for Australia, Murray is determined to finish a glorious Irish season with one last high. "I think this group, the success that we had the last time we were together was fantastic, we've all been aiming for that for quite a while but we all want to finish this season on a high and we're all really competitive that way," he said. "It's a challenge to come here against one of the big-dog teams and put down a marker and to get a result down here is something everyone in our group wants to do - our coaching staff, the wider staff and our playing group, it's a really competitive environment and I think we're really good at that, just moving on and looking at the next target, our next challenge and this is great. "We were in a good spot at the end of March. We've a lot of work to do to kind of make sure we step forward from that mark where we left it on St Patrick's Day. "Coming up against the Aussies in their backyard, they're a class side, they've got class players, they express themselves and they're very hard to play against, especially defensively. "They like to play with an awful lot of width. They've a lot of dangerous athletes out wide. It's great, though, I think everyone's buzzing to be here. It's a really exciting challenge for us as a group and we're loving it so far."